Juicy Couture perfumes are definitely cult blogger products, they're always raved about on Youtube and blogs but up until now I'd never tried them out (I don't even think I'd heard of Juicy Couture until I started watching beauty Youtubers, was I hiding under a rock or something?!) But after seeing their beautifully decorated bottles and hearing rave reviews of their sweet and fruity scents they've been on my 'to try' list. And as soon as I sprayed this beauty all I could think is why haven't I tried them sooner- this is gorgeous! Juicy Couture perfumes are created under the Elizabeth Arden brand (they also make the amazing Britney Spears perfumes) which I find quite surprising, but massive thumbs up to them on some truly beautiful fragrances. As for how it smells, you can probably tell from the notes above that there's quite a lot going on here. The top notes are fruity, the middle notes are floral and the base notes are sweet, yet somehow it's not overwhelming and it all comes together to create the perfect fragrance that has me wanting to smell my wrist over and over. Based on the base notes I imagined this would smell a lot more sweet and sugary, but the fresh and floral notes give it something a bit different. For some reason I get an almond/ marzipan/ cherry bakewell kind of vibe when I very first spray it on which is weird as there are no almonds listed in the notes, but I'm definitely not complaining it smells so nice! The staying power isn't quite as good as some of my other EDP's, although I still get a good six or so hours of wear time from it, so will easily last for most of the day or night. Finally, can we just take a minute to admire this packaging? If like me you appreciate the girly things in life then no doubt you'll be as won over by the gaudy yet beautiful bottle as I am- the pink bow, the gem lid, the charms and the gold hardware oh it's just perfect. It's by far the prettiest and most elaborate bottle in my collection, every time I've walked past my perfumes I've ended up picking this up and swooning over it it feels so weighty and well made. This huge 100ml bottle was just £42.99 from Chemist Direct, I'm completely blown over by the price as in highstreet shops the 50ml bottle is more expensive than this! If you're in the market for a sweet girly perfume with gorgeous packaging you won't be disappointed with this, I can see why so many people love it. 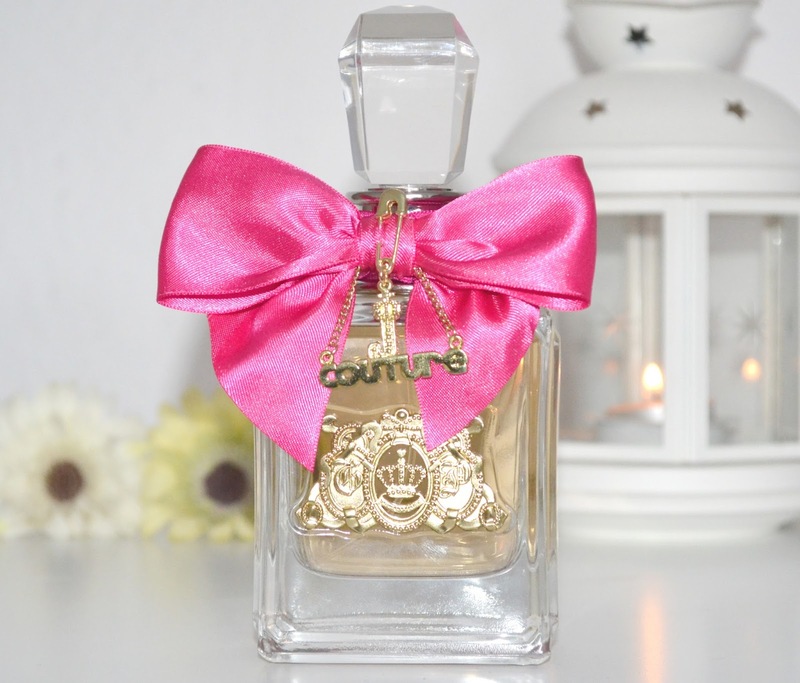 Have you tried Juicy Couture perfume before? Which is your favourite? I'd buy this for the packaging alone! I've never tried this fragrance but i love the bottle so much, so girly and super cute! 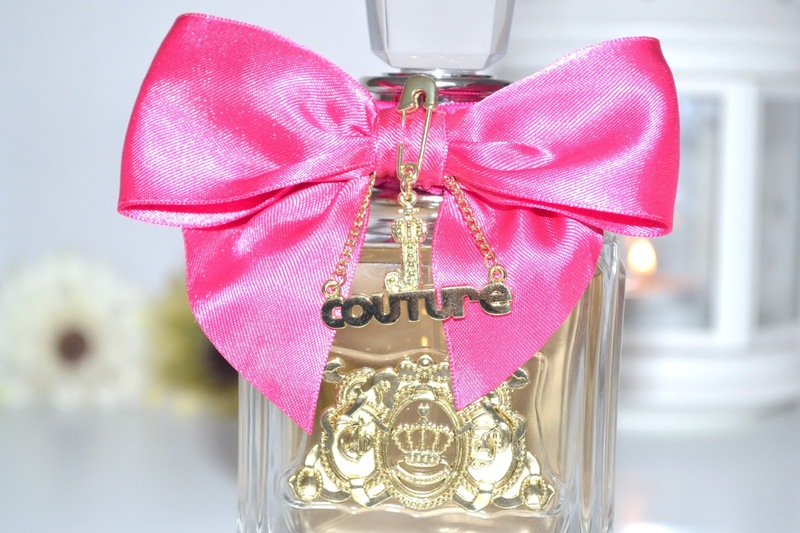 Love Juicy Couture, I always ask for a gift set for christmas! That bottle is so cute! It sounds like it smells nice too! I've not tried this one but I have the Noir and I really love it....plus the bottle is just gorgeous! I got this perfume as a gift last Christmas and am in love with it! I love how it's got that sweet but subtle smell so us girls in our mid-late 20's can wear it without it being too sweet. Love love love!